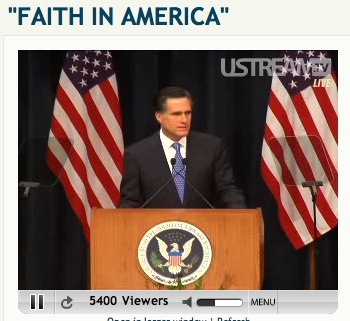 Governor Mitt Romney, a US Presidential candidate, today gave a national speech LIVE on Ustream.TV. Introduced by George Bush Sr., Gov. 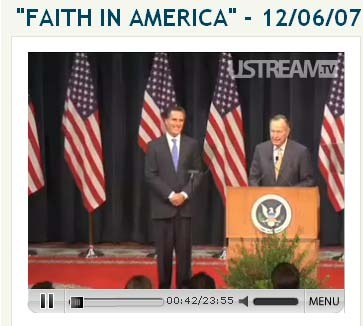 Romney spoke very eloquently about his faith and its impact on his potential presidency. This was a highly viewed stream reaching 100,000’s of people across the world for the live and recorded feeds. Whether you agree with Gov. 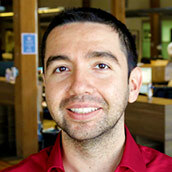 Romney or disagree, you can’t help be amazed at the free flow of information, specifically video, that continues to revolutionize our lives and the web. Microbroadcasting of live events (not otherwise covered by main stream media), then interacting during them through chat, is powerful, engaging, and normally a incredible experience.